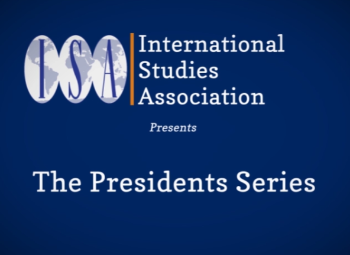 Welcome to the first installment of the International Studies Association Presidents Series of videos, recorded at the 2015 ISA annual conference. The goal of these videos is to enable past presidents of ISA to share thoughts on their prior research and the future of the discipline. ISA hopes to continue these interviews with additional ISA presidents in the future. We hope that academics and non-academics alike will enjoy and benefit from these thoughtful, short, discussions by some of the most well-known and respected scholars in the field. Stay tuned for next week's release of the second installment!